I first learned this recipe from my Aunt Mimi who lived near Carmel. 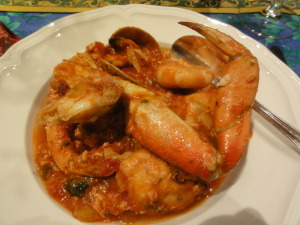 It is a terrific dish to serve to visitors to the Bay Area in the winter when our Dungeness Crab is so good. Every country has it’s version of a fishermen’s stew–I understand the origin of this recipe is Genoa–it’s a San Francisco tradition! To steam the clams, place them in a heavy bottomed pot with 1 inch of water. Cover and cook over high heat, shaking occasionally, until the clams are open. Keep covered until ready to use. To make the soup base, put the onions with half a teaspoon of salt in a large Dutch oven with a generous splash of olive oil and cook, stirring from time to time, until the onions are softened. Stir in the garlic and continue to cook and stir another minute or two. Stir in the fennel, then the tomatoes, tomato paste, wine, red pepper flakes, and oregano. Then add the broth from the steamed clams leaving the last tablespoon in the pot since it probably has sand. Bring this mixture to the boil, stirring, and let simmer gently for 20 minutes. parsley and serve in warmed bowls with sourdough bread. Serves 8.
from the body of the crab, remove the gills from this and wash under cold water. Break the body in half. Chill the crab until ready to add to the stew. Note: This would be wonderful served with Italian bread, spread with a mixture of butter, mashed garlic, salt, and minced fresh oregano; and also with a spinach or mixed greens salad.